An all powerful God creates everything in existence, on his time schedule. That is true in the 1st century or the 51st century or the 151st century. One needs to come to the understanding that there is a hierarchy in this worldview. God is the infinite Creator. Man is the finite creation. In this hierarchy, Martian microbes or your pet squirrel are not equal to God or to man. Think about that the next time you see people dressed in chicken suits protesting in front of McDonald's Restaurant. They are freely excercising their man-made religion of syncretism [sic]. this weeks episode is made possible by A BENEVOLENT MYSTERY DONOR who has entrusted me with a HAUNTED TAP AND DIE SET.Once owned by legendary cartoonist GARY LARSON to cut threads on a 1/75th scale steam locomotive model running the length of his eccentric backyard far-side calendar funded Xanadu. by Erik on 9/4/2009 @ 12:17am Hard to believe we are already up to episode 23. 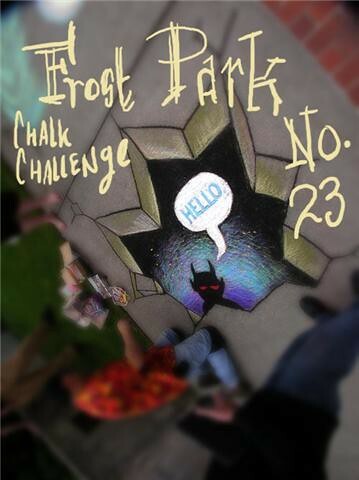 Does that mean there are only 7 more Frost Park Chalk Off episodes after this? by NineInchNachos on 9/4/2009 @ 7:43am I won't be able to make it. 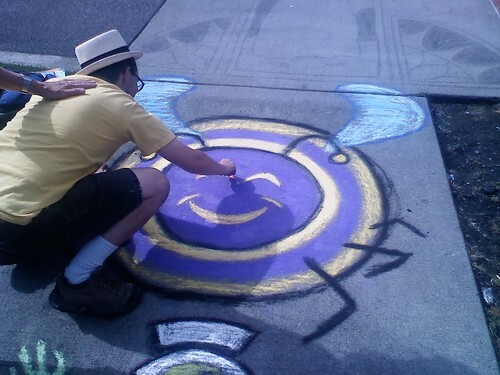 hopefully somebody will bring extra community chalk! by Mofo from the Hood on 9/4/2009 @ 9:05am I pray that your event be blessed with Chicken McNuggets falling from Heaven. by Dave_L on 9/4/2009 @ 12:17pm I am looking forward to seeing what everyone comes up with today! I work too far away now to even occasionally show up in person. Next Wednesday, September 9th, it will be 32 years since Officer Larry Frost (for whom the park was named soon after its completion), was murdered in the line of duty. I might write a small blog entry on the park, so Kevin, if there is a way I can email you and get back those early park photos (or if there's someone you can get them to whom I can come get them, I'd like to include those photos. 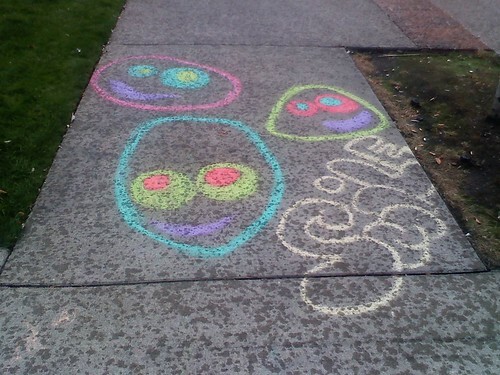 I miss the chalk-off! by kiru13 on 9/4/2009 @ 1:31pm I wonder what Adam the alien will do? by kiru13 on 9/4/2009 @ 2:09pm Hellooo! Anybody home? by NineInchNachos on 9/4/2009 @ 2:16pm post your pics if you got them! Max enjoyed the children's museum in Olympia sorry we missed it. by kiru13 on 9/4/2009 @ 2:31pm GRRRRRRRRRRRRR!!!!!!!!!!!!!!! by Erik on 9/4/2009 @ 2:33pm Does anyone have any pictures today of the Frost Park entries? by NineInchNachos on 9/4/2009 @ 2:45pm oi, disaster! by Erik on 9/4/2009 @ 2:52pm There was a woman there with a camera that took pictures of all of the entries and we discussed how to post them. We will see. Less than 8.5 hours left to vote for the winner! by NineInchNachos on 9/4/2009 @ 2:58pm are you still downtown Erik? After work could you snap some cell phone pics as backup? by kiru13 on 9/4/2009 @ 3:05pm YIKES! 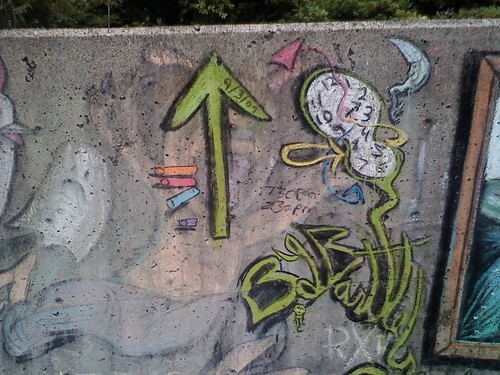 by kiru13 on 9/4/2009 @ 3:07pm Less than 8.5 hours left to vote. Yikes! by kiru13 on 9/4/2009 @ 3:07pm Could you snap some cell phone pics as backup? by kiru13 on 9/4/2009 @ 3:10pm Could you snap some cell phone pics as backup,Erik? by Erik on 9/4/2009 @ 3:21pm Ok. I just saw that my cell phone was on auto capture when I was at Frost Park. by Erik on 9/4/2009 @ 3:24pm I vote for Adam the Alien! by kiru13 on 9/4/2009 @ 3:25pm I love Adam the alien so give my vote to him! 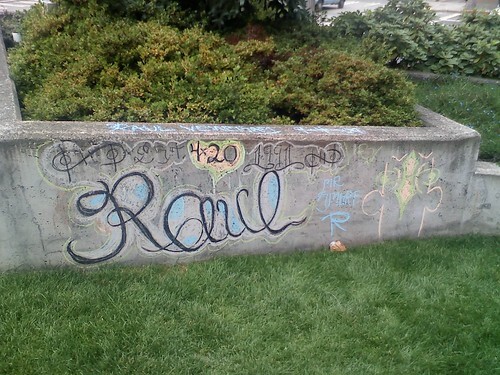 by KevinFreitas on 9/4/2009 @ 4:04pm Sorry gang but I was driving south today during Frost Park. We should just setup a webcam at the park. I withhold my vote in case any other entry photos surface. 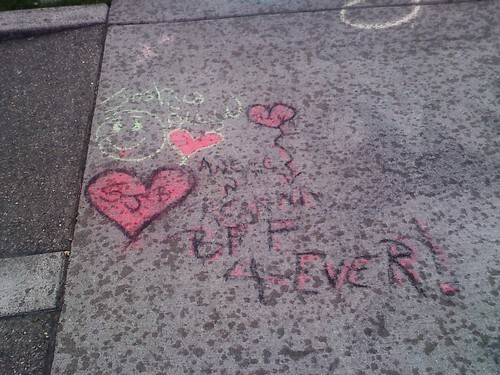 by kiru13 on 9/4/2009 @ 4:16pm when I said I love Adam the alien I meant like a big brother:)! by Mark Monlux on 9/4/2009 @ 5:06pm Lunch with a friend from out of town (and my wife) kept me from coming down and participating at Frost Park today. I will try to get there next week. I do like the homage to the classic Japanese wave print. Very nice. The surrealness of Unknown artist No. 4 was very captivating. But, without a name I find it hard to cast a vote for him. I love the childish simplicity of Unknown artist No. 5. But, it's Brian's hanging picture of a whale that gets my vote this week. 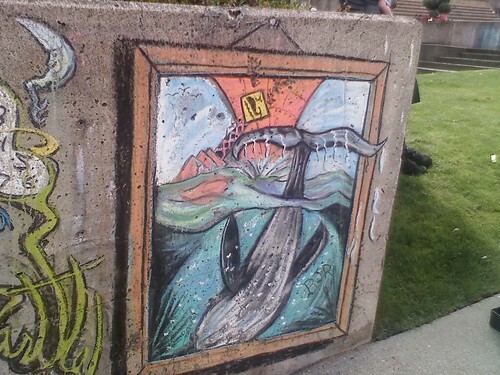 by NineInchNachos on 9/4/2009 @ 5:25pm I believe brian's art is in reference to the dead whale that was impaled on the prow of a cargo vessel over at the port. I'm going to have to vote for brian as well. the Japanese wave is awesome too however. lots of unknown artists! very cool! by daydreamer on 9/4/2009 @ 6:02pm I'm voting for Adam the alien because I really like that bee! by Earthdaughter on 9/4/2009 @ 6:02pm Ok, folks, "unknown clothing store artist" is Julie, came to have lunch with Izenman (sp? ); "Unknown artist #2" is Jim and Patricia (read the fine print! ); "unknown artist #3" is - duh! - Raul!! And he says he'll be back next week; "unknown artist #4" is Brian's 2nd piece (I'll let him tell you about why there are two, etc. My lips are sealed! ); "unknown artist #5 is the young guy with the purple spiky mohawk who's been there before but said he didn't care about entering the contest. 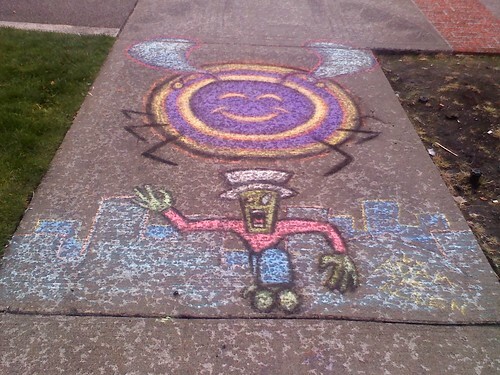 He just wanted to chalk! Whoo hoo! And "unknown #6" was a lady and her grandson (?) who chalked after 1 pm. So all that being said, I'm going to vote for Jim and my piece for artistic reference to Hokusai's "The Wave" adapted for Tacoma by substituting Mt. Rainier and adding the full moon for today's lunar happening. Betcha didn't know all that was in there, huh! And I loved Adam's tribute to the bee that chased him around the park while he was looking for inspiration for a chalk piece! Be careful what you ask for, Adam! Ok enough! Sorry so many couldn't make it, but we had fun. by Bjr on 9/4/2009 @ 8:44pm I am not going to be around much in the future. I am headed back to work soon. 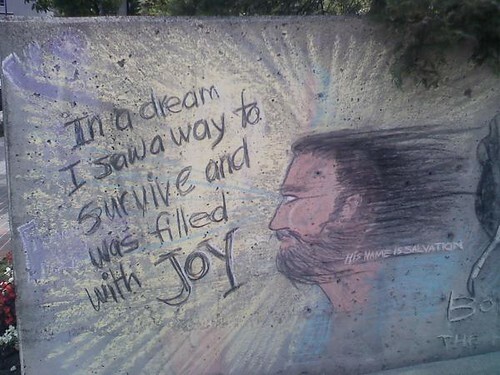 I will still stop by at odd times to leave my chalk. Halloween.! CAN'T wait. Many more Fridays drawn in my head.....Keep a look out! by Erik on 9/4/2009 @ 9:17pm I will still stop by at odd times to leave my chalk. by Adam the Alien on 9/4/2009 @ 9:59pm Hm...there were others who took pictures who said they'd post them here. Most notably muttonofthesea (on Twitter). Wonder why they haven't been posted. by Mofo from the Hood on 9/4/2009 @ 10:07pm Unknown Artist #5's experiment in color and form juxtaposition is beyond comparison with the other entries. His/her/it's departure from the use of black, and strict adherence to pastels has produced a work that evokes an inexplicable eeriness. He/she/it challenges the viewer to look beyond the superficial direct qualities of an image and instead delve into the mystery of what comes through those transparent face like images. This work by Unknown Artist #5 defies a frame of reference. It defies a point of relevance. It is nothing less than a point of conflict. by NineInchNachos on 9/4/2009 @ 10:45pm kevin votes for the wave... but he needs to use the word vote. gah! by Courtney on 9/4/2009 @ 10:45pm My vote is for Adam! by crockawaddy on 9/4/2009 @ 11:05pm Adamthealien gets my vote. Love the look on the alin and the bee's faces - the hunter and the hunted. by AngelaJossy on 9/4/2009 @ 11:07pm I vote Brian. I like how the tale sticks out of the frame. I like that there *is* a frame and that it is 3D with a shadow and everything. I also like whales and water in general. I almost voted for the waves by Patricia and Jim. It was a close call. 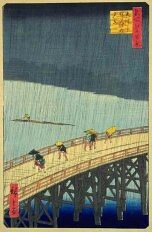 Do you think the rain influenced people to do water-themed pieces this week? Close, RR. But ceci nes pa un pipe. by NEAL on 9/4/2009 @ 11:15pm My vote is for Brian. Mmm whale. by babycakes on 9/4/2009 @ 11:35pm I vote for Brian! Save the Whales!! 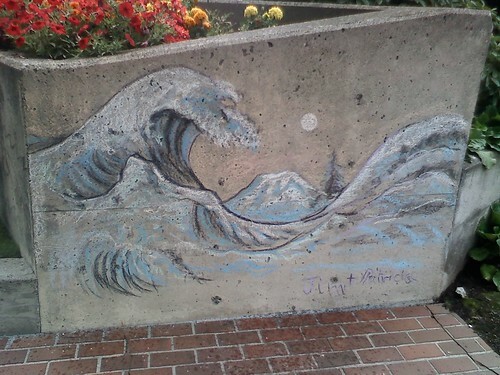 by Dave_L on 9/5/2009 @ 12:01am I vote for Jim and Patricia's "Great Wave off Tacoma." by Dave_L on 9/5/2009 @ 12:06am I know that vote was a minute late.... I was having nagging signing-in and password re-set issues for half-an hour until I finally gave it a try on Firefox. Congrats to Brian and we look forward to seeing what you deposit at the park from time to time! Hope to see you there again soon! by Erik on 9/5/2009 @ 4:02pm Nice work Brian. Congrats! by NineInchNachos on 9/5/2009 @ 5:47pm right on. by L.S.Erhardt on 9/5/2009 @ 6:22pm As I am too late to the party to vote, I can't vote... obviously. BUT I can say that I like Jim & Patricia's waves the best.